Every year at around this time, a certain flower blooms at the corner of our garage. As we drive in or out, the huge blossoms always take us by surprise. It’s a combination of their beauty, their size, their fragility, and the realization that the summer is almost over. I don’t know what internal structure supports their mammoth size, but it must get worn out by the end of the day. By dusk the petals are withered and drooping. The next morning those blooms, or maybe different ones, are open again drinking in the sunshine and defying physics. Buds are in line behind them for a show that will last several weeks. And then they’ll be gone. This plant always begins to bloom when Steve is ready to go back to school, about the time I’ve forgotten that he’s only home in the summer. While he goes in to get his room ready practically from the time he leaves it in June, I tend to forget that vacations, lunches out, running errands together, and watching TV past 9:30 p.m. aren’t the norm. Just about the time I get used to having him home, he’s back to his classroom full-time. You’d think after 31 years of marriage I would be more in tune to the pattern and I wouldn’t be so surprised, but I’m not. You’d think I’d hate this time less, but I don’t. When the flowers come I find myself asking: Did I make the most of it? Did I cherish our time together? Did I wring out every drop? I always want more time. This year, and for every year that follows, the beautiful plate-sized flowers with their translucent petals will have another meaning too. Mom fell five times since spring. No broken bones, but with each trauma the Alzheimer’s took a little bit more. She’s forgotten how to move her feet to walk and what balance feels like. Even if her brain could remember, her muscles have lost their strength. The words she speaks are adrift in a sea of strange syllables. Her understanding of the things around her grows dimmer. Some days she won’t sing. Hospice has begun. She seems as fragile as the paper-thin petals on the blooms by the garage. Your mom has been, and is, a big and beautiful part of your life, just like these flowers. My thoughts are with you all during this time. Ami, the blossoms look like hibiscus (but the leaves don’t). Look the right size. But I’m not a gardener, what do I know? Sorry the hear about Mom having more falls and the further deterioration. Major hugs to you both. I so sorry. When Dad had dementia, he was wheelchair bound for the last 9 1/2 months. Even after they put him on hospice, he lived six more months. I don’t know if that was good or bad. I can imagine how hard this is for you. Take care of yourself. My prayers are with you all. My mother in law had dementia and slowly disappeared. Some days were better then others but, hospice made her life so wonderful. I work for a hospice organization and know how wonderful these nurses are. God bless you both. You’ve been such a wonderful daughter. Remember you need to care for yourself also. I hope, in time, the arrival of these flowers will come to mean something a little more comforting to you–like maybe the continuity of life. May your Mum be like the flowers, always a surprise. My heart hurts to know that you are feeling such pain. May your Mum’s days be filled for her, with sunshine and beauty. Keeping you and yours in my thoughts and prayers. Ami–Put some little thing in your mother’s hands. A little quilt, maybe. A little piece of soft fabric, maybe. Touch her and talk softly to her. She may respond. She may not. I believe that somehow she’ll feel all that love from you. Soon, I think, her mind will be clear again. The wonderful, beautiful, fragile flowers have some special meaning and will remind you to think of her when she’s gone. My thoughts and prayers are with you now. Take care and thanks for all that you do. That is a hibiscus and a beautiful one at that. Pale petals with a blush of pink just for you Ami! Rest assured that you have countless prayers coming your way all through each and every day. Sometimes having to endure these times just proves to others, watching on the wayside, just how strong and beautiful a person this parent raised. This is a dreadful disease. It stinks. It’s taken your mom away and left remnants of her body here. Please take care of yourself. You’re so important to the rest of your family, and you have puddles of love from your students and your fans, the quilters of alzheimer’s quilts, and all the people you touch with your blog. Take good care of you. The flower is a hibiscus–when I lived in Florida years ago, they bloomed I think l2 months of the year. They came with the house we bought in Tampa. My best friend’s sister who is in the Alzeihmer’s unit at a local nursing home has to move by the end of September as this particular unit is being closed at that time. We hope the transition to another one farther away will not be as bad as we fear it will be. Your words about your Mother always touch me deep in my soul. My Mother has been gone for 9 years now and was beginning to show signs of dementia a year or so before her passing. I would give anything to have her here, even for a little while, to hold her hand and talk softly to her. She was my rock, my hero, and I was always a star in her eyes. We simply cannot replace the love that our Mother’s give us and I know that your Mother still has that deep, abiding feeling in her heart for you. May God Bless and Keep You all. Send my hugs your way. I understand the loss of a parent and your deep love of your husband. You are blessed to have such wonderful souls in your life and such wonderful memories of both of them. The flowers are a reminder of both. Cherish them. Ami, My thoughts and prayers are with you and your Mum. I can only imagine what this is like for you. I wanted to say “thank you” so much for all you are doing… to further research and in bringing all of us into your life to see a little of what this awful disease is doing to so many. My neighbor’s husband has Alzheimer’s, but not as advanced as your Mum’s, yet. They aren’t just our neighbors, they’re a big part of our lives and we think of them as family. They live in Cedar Rapids IA, but spend their winters here in Arkansas. Pat says they may not be able to make it this year. It would be our first winter without them since 1986. 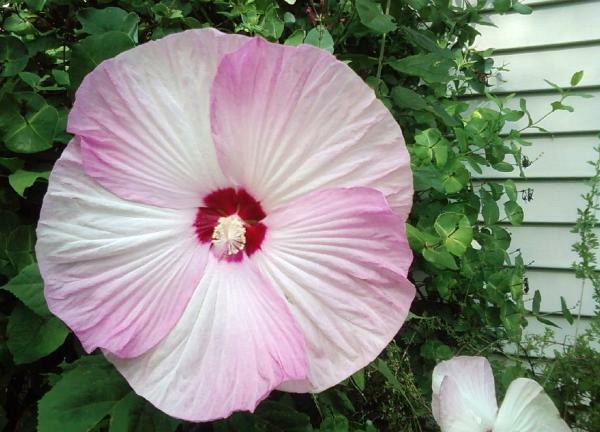 Thank you, too, for sharing your gorgeous Hibiscus with us. 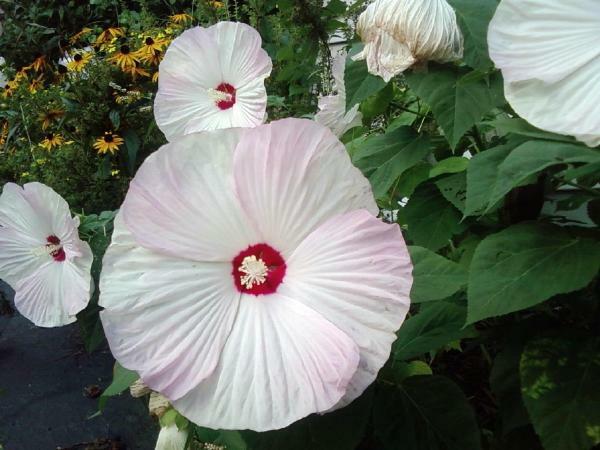 Those blooms are a perennial variety of Hibiscus, and although right now they are a bittersweet reminder of what your mom and your family, is dealing with, I hope you also allow them to remind you to look for the little things we are given to brighten the dark times. My thoughts are with you all. Those beautiful flowers are what you remember, not the plants that have faded away with the coming of the cold. And I hope that is the way with your mom…you will always see in her and keep in your heart the wonderful, incredible, amazing and loving woman who raised such a wanderful, incredible amazing and loving daughter. There will be peace for you both — I know that from my soul. Ami, you are such a wonderful daughter. I am sure you are a comfort to your mom. If there is some comfort for you, it may be that you have much time to say “Goodbye!” to her. I lost my mom 9/3/93, and she went quickly into a coma. I never got to say goodbye. I am relieved that she did not suffer long as many with cancer do. These are mixed blessings. Keep all of the good memories in mind and heart. She is always an important part of you! Sending love and prayerful support to you during the uncertainty of these precious, fragile days. We too are experiencing the decline of our loved one, Patrice (Pat) Gollen. Hospice has been called and involved as of the beginning of this month (August). Just a short month ago she was being fed her 63rd wedding anniversary cake. She was trying to remember who I and my mother were. Now there is…nothing. She doesn’t respond to voices or babies. She became a great-Grandma twice-May and July. Oh! How she loved her “babies” which includes her pets. We have lost the sweetest, most loving, creative woman. And, I sit here grieving…You KNOW!!! You and MOM remain in my thoughts and prayers often. When I met her at the young age of 70- I never had met a women that lived her life so fully- and with so much energy….amazed at the things she did and the new adventures she undertook with out any regard to her true age- she was and will always be an inspiration to me. As each day takes more from you- may you know and feel the love of those that care and may that help you through the days ahead. My heart is with you. My prayers, too. The strength of your love for your family will prevail. I know it. You are already missing the mom you once knew. But she has known your love as you have known hers, and that love is never ending. I wish my mom and I had such a warm and loving relationship. I’m grateful that I shared that kind of relationship with my mother in law. I was the daughter she never had and I cared for her until her death. I will always miss what we two shared. Ami, So sorry to hear that your mom is in hospice. It’s a difficult time for you as the daughter, but I know you’ll find her hospice caregivers to be very loving and warm. My mom was in hospice for only three days. Her caregivers made every moment special. I pray the same for you and your family. What can I do to help? You and your mom have been so helpful in bringing this dreaded disease to the attention of millions. You both have taught us a lot about life and how fragile it can be. Thank you for doing that and sharing your mom with us. Blessings to both of you. Ami, having lost my loving a precious grandmother this same way just 5 days after her 89th birthday I share your pain as does anyone who has had to live with this terrible disease. We were very lucky to have 5 generations and she did “live” to experience 1 of her 4 great-great grandchildren. God Bless you for all your work and the daily effort to keep reminding everyone of the need to beat this demon! You speak to us all, usually with humor and fun, but this little gem is so sad. I send my love to you and your mom. You write so eloquently about your mom. I have a LONG time family friend who is now suffering the beginnings of this disease. It is so heart breaking. Thank you for sharing your journey to help me see one of the paths it takes. We lost my mother-in-law Ida just two weeks ago after the slow decline of dementia – just as your book & quilts stated – we lost her piece by piece. In the end, it was a blessing to see her go to heaven where she can be whole again. Having heard about your Mom when you did a presentation at the Jackson quilt guild, I know your Mom is a wonderful person who will be greatly missed by all who knew her. Those lovely flowers have the unexciting name of Swamp Mallow. Here in the 45 parallel north, my husband grows them in pots, that we bring in at night, because otherwise, they think it is fall before they are finished blooming, and die down with the buds still on them. I delight in them every fall because they seem to be one last surprise before winter. Just getting caught up on your blog. It is great. I think the flower you are showing here is a Rose of Sharon. When I lived in Ohio we had several bushes that ran up the west side of our house and in the winter there where seed pods that the little winter birds would come just before snow and settel in the bushes and stay there until the big snows where over. No snow in Florida just these peskie storms. Your mother, this flower, and you, Ami…are all beautiful gifts in our lives. Without your mother and the challenges she has faced, you wouuld not be where you are, doing what you do and inspiring each and every one of us…day by day. I am ‘home’ in Alaska right now, helping my own mother with Alzheimer’s through a challenging stage and I can so relate to all you write about, feel, and do. You give so very much to her, to your family, and to all of us…thank you.